Such a protein packed uthappam, love the addition of kodomillet here. Even i love to add millets in more of my dishes nowadays. Especially i dont forget to add millets in adai or in idly batter. I have tried adai recipe with varagu from a tv show a lot time before and like it so much. The flavor that you have used in this adai is quite different from what i usually make. Will try your version soon. Sounds more flavorful and delicious. Protein-packed Uttapam. These are great and easy ways to incorporate millets in out regular day to day food. This marathon has been such an eye opener for me , I have loved all your healthy millet recipes and this uttapam is no exception ! Great idea to use millets instead of rice . Great recipe using kodo millet. These are a good choice for those looking for rice free recipes beside being healthy and protein rich. Healthy uthappam.. Perfect pick with kodo millet!! Great way to sneak in millets into everyday recipes. No-ferment adai sounds absolutely delicious and convenient to make at a short notice. That is a great way of using kodo millet. I have been using millets in recipes for the past four years and it is quite easy substituting rice with millets. And no one will ever find it out. 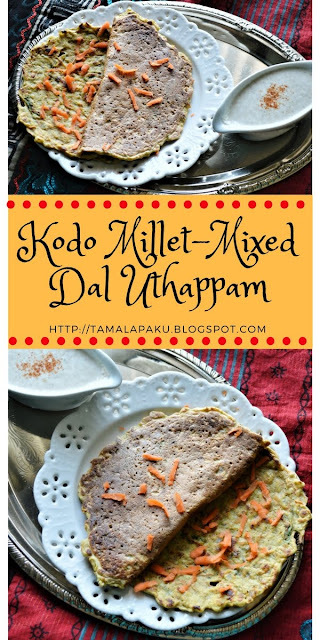 Will add this version to my list..
Kodo millet and dals together in this uttapam must have tasted amazing and I am sure it would have been healthy too. I'm always looking out for lighter dinner options and this uttapam fits the bill. Healthy and easy to digest. Thanks for sharing the recipe. Such a fantastic dish Harini. Replacing regular rice with whole grains is such a wonderful process! Such a healthy and delicious looking no fermented utttapam !! Such amazing way to use millets, Nice idea of substituting millets instead of rice !! Good idea to use millet instead of rice in the adai. I love adding many different lentils when making adai and adding millets makes it even more healthier. I too love instant dosa / adai versions for their no ferment method. And I also made something like this for the marathon. Not sure if I have said this before but love you plate so much!!! another fantastic recipe with millets, adai is one of the quickest and easiest to make, i love these no-ferment dosa type!!!! BTW, love that pinterest image label design!